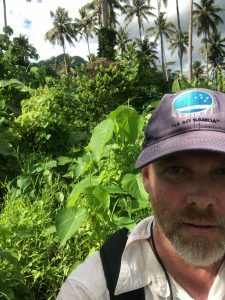 We’ve kicked off field work for our research on the development of Samoan agriculture and political complexity in the Falefa Valley, ‘Upolu, working with the villages of Falefa and Falevao. 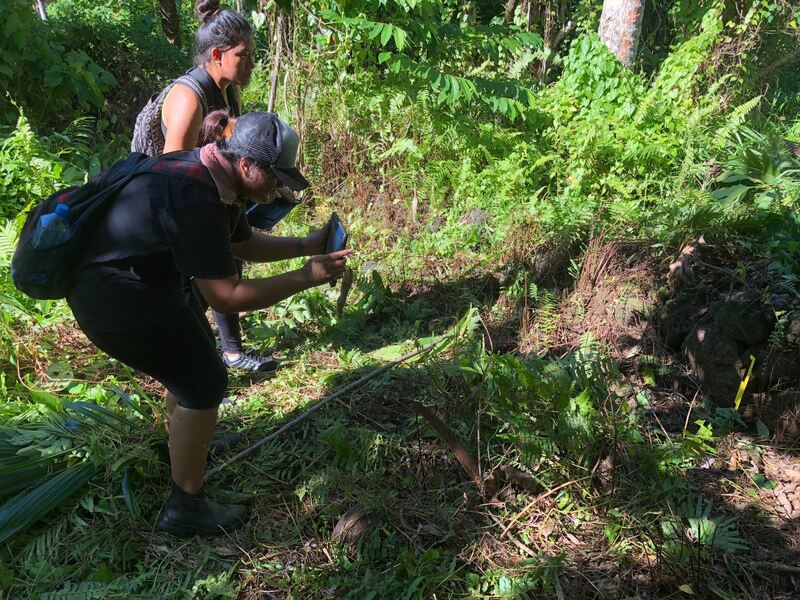 Last week Associate Investigator Matt Prebble and I had National University of Samoa Students working with us as part of their HSA380 Field Archaeology course. The upcoming week we will have a new batch of students on the course. 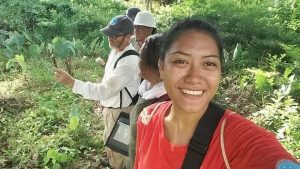 University and Centre for Samoan Studies staff, lead by Matiu Matavai Tautunu and Dionne Fonoti, have also helped behind the scenes and in the field. Samoan archaeology student Vinimua captures the discussion of something important over there. Our first goals is to map the extent of agricultural features such as rock walls, ditches, and terraces through a combination of lidar-based feature extraction and ground-truthing. We are working with the feature extraction data produced by Associate Investigator Seth Quintus at the University of Hawaii. With our field data, Seth should be able to tweak his extraction procedures to get better results. One obvious issue we are encountering is the use of rocks from old walls to build new structures. The old wall are visible in the field as exposed base-courses, but don’t show up very well in the lidar. 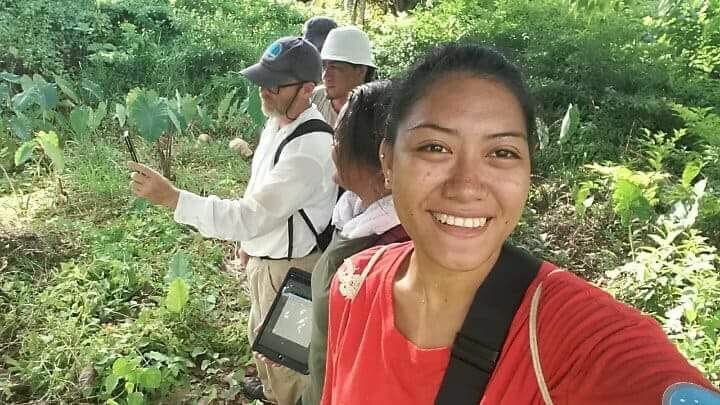 Samoan archaeology student Rachel records a rock wall. We use a combination of Bad Elf GNSS Surveyor units, bluetoothed to iPads with ArcGIS Collector to collect field data. 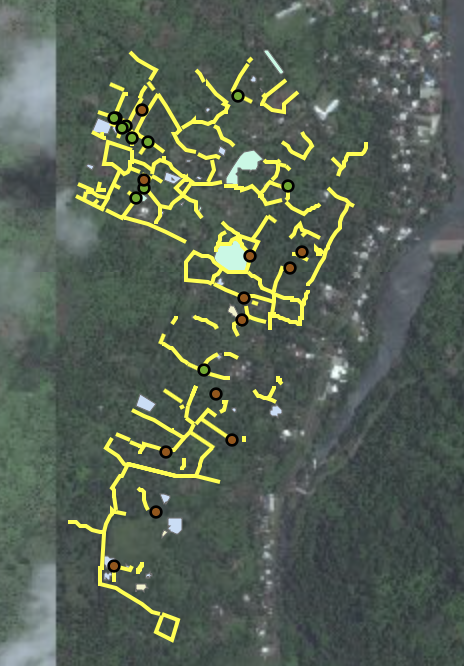 This is a really slick system and allows us to upload data every day to our ArcGIS enterprise cloud where Seth (currently in Hawaii) can check on our work, offer advice and ask for corrections. The Bad Elfs are working surprisingly well. I was nervous about their accuracy in heavy canopy, but they are consistently getting sub-5 metre accuracy and down to a metre or less with clear sky. Trimble has got a serious competitor here. Some of the features recorded thus far include walls, starmounds, and stratigraphic relationships. Our field data after just five days at work is pretty extensive. 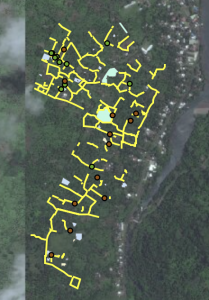 Although the valley is huge, I think that after a couple more month long sessions over the next year we will have generated an impressive amount of spatial data on agricultural infrastructure. It’s hot surveying in the Samoan bush. In a little over a week’s time we will be working with the D-section corer in the inland lake-caldera. For more check out the Centre for Samoan Studies, Research Gate, Google Scholar and Twitter.